Italian Gems is a free Windows 8 Recipe App. In this Recipe app, you will be able to get information on World famous Italian Food recipes. 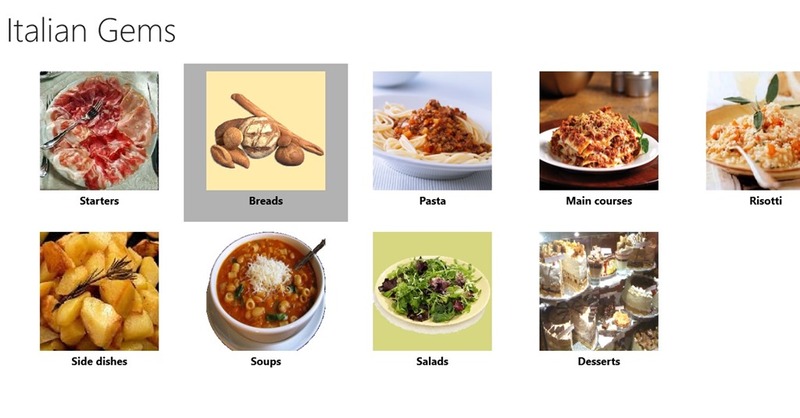 Recipes that are available in this Windows 8 Recipe app are categorized on the basis of their dish type. From the available categories, there are some like Starters, Bread, Pasta , Risotto (misspelt as Risotti), Side Dishes, Soups, and others. Under each category the Recipes are organized and provided with some Introduction, Ingredients, and extra comments so that you can understand the recipes even better. 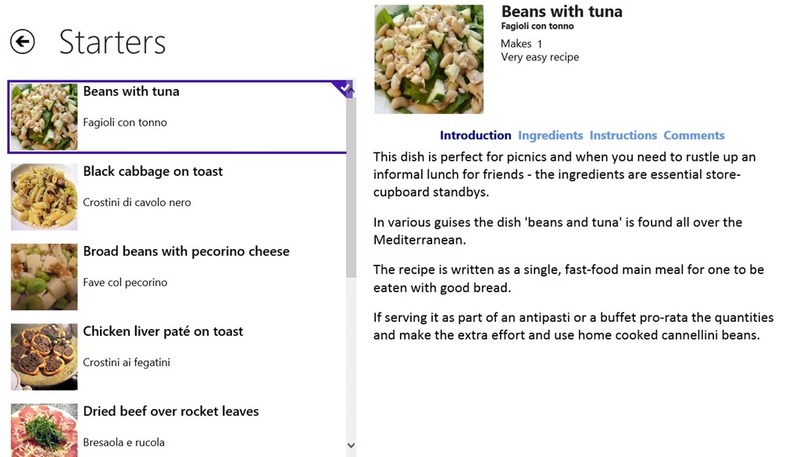 This Windows 8 Recipe app is freely available in the Food & Dining category of the Windows Store. 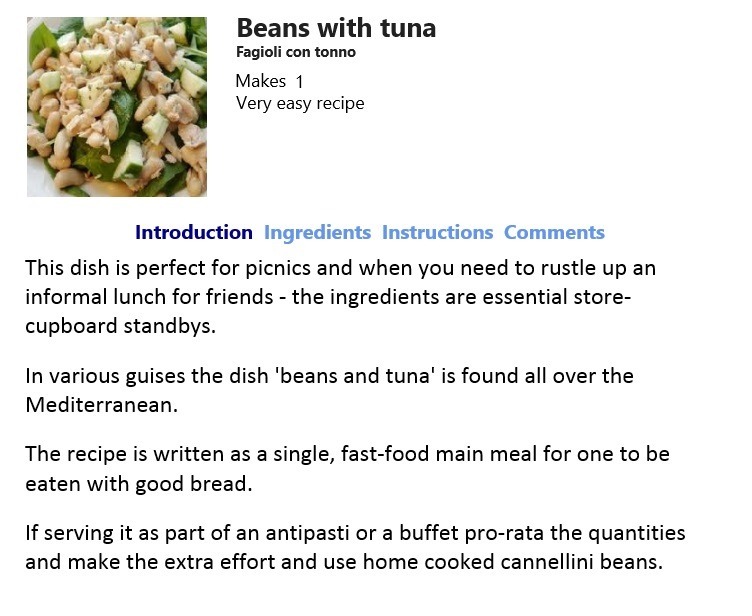 As you get to the main screen of this Free Windows 8 Recipe app, you will get Italian recipes categorized according to their Dish Types. The main categories available here are Starters, Breads, Pasta,Soups, Salads, and many others. As you open any particular dish type, the next page that appears will show you all the recipes that belong to that particular dish type. On this page, all the related recipes would be displayed in a panel on the left side. The panel on the right will show the recipe picture, and links to its introduction, ingredients, instructions, and comments. The Introduction part will have things like what is the dish in general, for what occasion is it prepared for, what is it used for, or any other fact related to it. Under the Ingredients portion, the main ingredients of the particular item will be present. The Instructions will give you the step by step procedure you should follow to prepare the item. Use the Comments section and you will be able to get the extra things that you should know about the recipe like something you can add to the recipe to improve its taste or to preserve it for longer time. Also check Yumvy Cooking Companion, Recipes by allthecooks.com, and Italian Recipes. Free: Italian Gems is freely available in the Windows Store. Get good amount of details for any recipe using this Windows 8 Recipe app. You can even print the recipes available here. As per my experience, this Windows 8 Recipe app can turn out to be useful for you if you are into Italian food or are looking forward to try it. But, there is one thing that I would like to mention, that is, had there been an option to view the videos related to any particular recipe (like its preparation video), the app could have been more useful. Try the app and share your experience with us via comments.